Just a few days after returning from their private wedding in Italy, Deepika Padukone and Ranveer Singh are ready to kick off the celebrations with their family and friends in India. The two have shared six new pictures from their mehendi, haldi and wedding ceremonies in Italy, each more handsome than the other. Looks like the post-wedding ceremonies of Deepika and Ranveer were full of fun. The two are seen wearing designer Sabyasachi. For the mehendi ceremony, they both opted for a co-ordinated reddish attires and while DP complimented it with a shawl and heavy jewellery, Ranveer opted for a waist coat. Deepika Padukone and Ranveer Singh will also throw a reception party in Mumbai on November 30, 2018, at the Grand Hyatt in Mumbai and the who's who of the town will be present to bless the newly married couple. 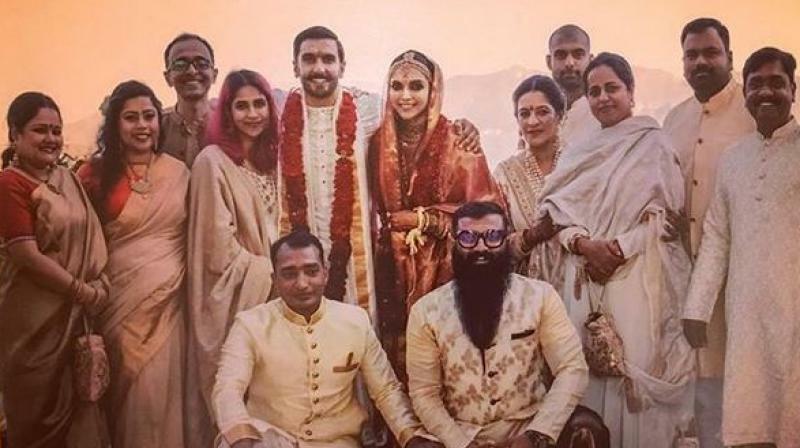 Ranveer Singh and Deepika Padukone got hitched on November 14 and 15 in Lake Como. Her look comprised of an ivory anarkali worn with a matching jamdani dupatta. On the other hand, Deepika while getting her Mehendi done or while dancing looks regal! They have been back now and have been releasing their photos of the various wedding ceremonies from Lake Como, Italy well, one by one. The Padmaavat actors returned to India on November 18 and they headed straight to Ranveer's home. Ranveer and Deepika then posed for pictures for the paparazzi at the airport and outside their homes. Earlier on Tuesday, Ranveer and Deepika were spotted at the Mumbai airport, heading to Bengaluru for the first reception which the couple has planned on November 21.